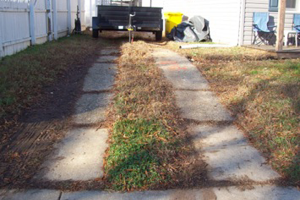 This Glen Burnie rental property driveway project instantly added curb appeal to the home. Previously the house featured an old concrete strip driveway. The drive was in disrepair and had many cracks and chips, and was sinking in areas. The area became a muddy mess during inclement weather. It was difficult to maintain and shovel in the snow. The homeowner decided to install a new driveway to make the property more appealing to potential renters and solve for issues when parking. A new driveway would allow renters to park in a clean area without worry of slipping or tracking in mud into the house. Our Maryland Curbscape crew excavated the old driveway, regraded, leveled the site, and poured new concrete. The finished project is smooth, clean and neat in appearance. The work only took one day to finish. The driveway is ready to walk on within 24 hours. Typically the curing time is one week before driving a car on the site. 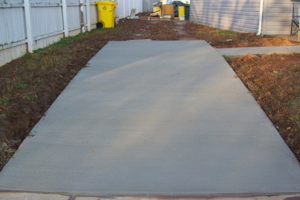 If you are interested in a project similar to this rental property driveway, contact the professionals at Maryland Curbscape. Our team strives to complete the job to your satisfaction, completing the job efficiently and quickly. We are proud of our excellent service record.